A great feature would be to let users rate comments or messages in a private team or open forum. This can be great, especially for Q&A so that the proper "answer" stands out more. So I have a marketing idea in the end, but really its a functionality and efficiency thing too. I wonder if it is possible to have an organization from another company in the organizations list. What it would take is a browser like window in Ryver. I currently have 3 Ryver organizations.. a couple elsewhere.. leaving them nameless. So I see it as an attractive venture to have other 'circle shapes' here in the list which opens a browser in the main window. You would set the settings up for the organization as a url, then you simply go through the motions of that platform as if you had logged-in on the web. This way the information pipeline is not managed by Ryver, all Ryver has to do is make sure it has a working web browser. Result: All 5 of my organizations in one platform in one list. Since Ryver is free, it may be a tool to help secure the new user that is on the fence due to having too many platforms between social/professional organizations. I just found Timezone.io today and am experimenting with it in the context of a Hubot script (GitHub repo). I definitely see the appeal of exposing this detail to our community. I just don't like the idea of forcing them to register for a new service, simply to provide the detail that already exists inside Ryver. It would be great to have bot actions to set the current timezone (for when we're traveling). It also would be great to have the bot action contextually get the current timezones for members - in the Direct Message, the Private Team, the Open Forum or the Organization. Hi team, again I must say I'm liking this app more and more as I use it. Anyway I was just wondering, is it possible to have the forum or team icon display next to its name on the navigation pane? It displays at the top of the chat room once I'm already in it, but it would be nice if I could select the chat room I want to get into, by identifying its icon. Its like when I see Jeff's picture in the idea thread I know the post is from him instantly. This will also brighten up the navigation pane a bit. Maybe this feature is already there but I doesn't work for me for some reason, I'm not sure. Btw, I think priority for this feature should be the desktop app. Thanks! When trying to login from an Android device using the input box (for organizations) the text is automatically changed by what seems to be a running script. On the Andriod platform this causes my Tablet (an Asus Android Tranformer with an external keyboard) to act oddly. It seemingly confuses the keyboard app and causes very strange behavior. Such as having to type each character twice or having the wrong keystroke show up on the screen. Creating a very tricky effort to login. This problem is also less evident but persists on the Desktop when doing a login from chrome. It seems you guys/gals placed a script to auto-magically turn all character into minor letters. But this seems to cause problems on Tablets and Desktops. As the input box seems to constantly rewrite what is present in the box as you type each character. This would be a great place to have a "Forums" button in the list, for admins at least. This way an admin can quickly see how many and to which forums the guest has been invited. Currently you must go to the each forum and see if the guests are in the roster. Integrate ability to segregate Forums into separate clustered topics. Please consider adding the ability for Admins to be able to segregate or cluster forums by topics. We use Ryver as a job management/ticket tool for different process stacks involved in a Tv Repair business. We are trying it out (and it is a great help) and find that we have about 30+ Forums for all repair jobs (by name) but are unable to group together different forums into "stacks". We would like the ability to "group"/"stack" different people at different stages of a process pipeline together so we can know at a glance how many people are at which stage of the pipeline. From Diagnosis to Ordering parts to Repaired. As there is a pipeline that gradually evolves for each separate Forum it becomes time consuming to keep tabs on which forum is at which stage of a process. On Linux 32bits (Ubuntu and Lubuntu) it's impossible to start Ryver. 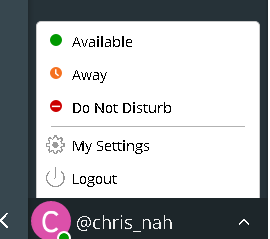 Similar to the old Yahoo Messenger "Buzz" feature it would be nice to have the option to grab another user's attention via a full scree alert or overlay that would require a dismissal. Noisy environments sometimes cause alerts to be missed or working on multiple systems at once. Whenever I open an existing direct message in Ryver Windows app all of the text in the DM is selected. Preferably, this should instead open a direct message and direct the user's focus to the message entry field. Posting ability within a personal chat. DMs, forums and teams have the 'Post' feature (which is amazing BTW).